I often encapsulate my scripts in a small GUI after I write them. This makes the scripts much easier to use for other people as it provides a more intuitive way to give the input parameters and also interpret the results. I am writing this post in order to showcase how you can easily create a small GUI and create a tool which you and your colleagues can use. As an examples I have chosen to create a simple tool which can compute the checksum of a file using a few of the most common hash algorithms out there. When creating this GUI I used primalforms to help build it. Primalforms is a great free program which allows you to construct a .NET form complete with the needed objects and the layout that you want. To create the file checksum tool I need two fields for input. One for the path of the file to check and the other to choose the hash algorithm used. For the file name field I decided to use an object of the type “TextBox” and for the algorithm field I chose a “ComboBox” which is a dropdown menu. To describe the fields I added some “Label” objects over the fields. To get the file path input I decided to add a “Button” object which I will later use to open a small window and allow users to browse and select files. I added a second button which will later be used to calculate the file checksum with the given inputs. Lastly I added a “RichTextBox” object which I will use to display the output (the computed hash string). After placing the objects where I wanted them I populated the text properties of the objects with the strings I wanted e.g. “Select File:”, “Browse” etc. I then populated the “ComboBox” dropdown with list of choices for hash algorithms MD5, SHA1, SHA256 etc. 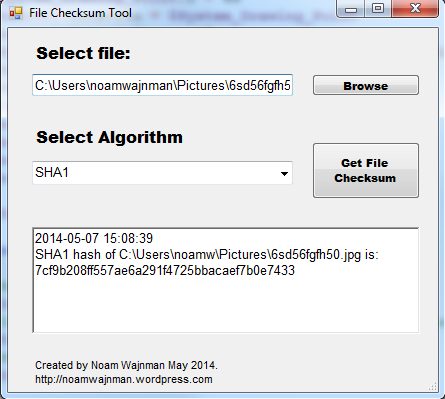 $form1.Text = "File Checksum Tool"
$label3.Text = "Created by Noam Wajnman May 2014. https://noamwajnman.wordpress.com"
$button2.Text = "Get File Checksum"
All that remains now is to write the button scripts so they execute the code you want when you press them. If you look in the form code exported in primalforms you will notice a few places where it says “#TODO: Place custom script here”. It is here that we must place our custom scripts which will be executed when the buttons are pressed. I chose to simply write the button scripts in separate files and then “dot source” the files as shown below. I will now briefly go over the two button scripts I use in the form. Voila! 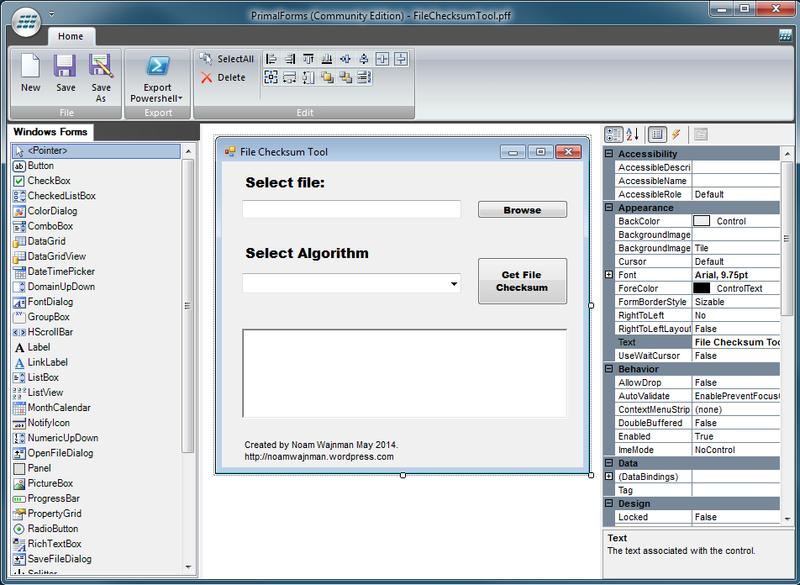 now the filepath will appear in the textbox when you have selected a file. #+					computed file checksum hash. $time = Get-Date -Format "yyyy-MM-dd HH:mm:ss"
$result = "$algorithm hash of $filename is:`n$hash"
$errorTitle = "Error - File name and algorithm not selected." $errorText = "Please select a valid file name and a hash algorithm and try again." In the #FUNCTIONS section I have written the functions I need to work with the form output and calculate the hashes/checksums. I won’t go over them in detail here as the post will become far too long. I will however explain how I use them below in the walkthrough of the #SCRIPT MAIN section. The first thing I do in the button script main is to validate the input a little. I use an “If” statement to make sure both inputs are given in the form. If not the script goes into the “Else” script block and runs the “Show-ErrorBox” function which makes a little error window popup which asks the user to provide valid input. Assuming the input is ok I then use a “switch” statement on the $algorithm object in order to run different functions based on the selected hash algorithm. For instance if “MD5” was selected then the function “Get-FileMD5” will be run on the $filename object given as input. The result is then saved in the $hash object. Finally, after the switch block I use the function “Write-RichTextBox” to display the $hash string object in the RichTextBox in the form. Voila! now the file checksum will be displayed as output on the form. Well that pretty much covers everything. All you need to do is create the form script and the two button scripts and “dot source” them as explained above. You can now simply run the form code script and your GUI will appear, ready to use! #+					using a selection of the most common hash algorithms.